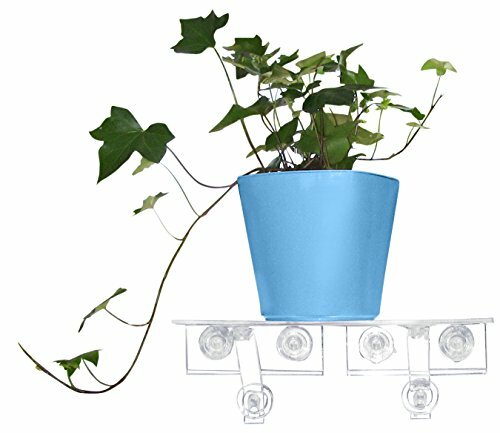 ALL YOU NEED IS A PLANT - Comes complete with the Large Aquaphoric self watering planter, Double Veg Ledge suction cup shelf, 2 Ledge Legs and Spongease fiber soil. NO OVER OR UNDER WATERING - Just fill The Large Aquaphoric planter with water, the plant draws up what it needs and the handy gauge tells you when to add more. MINIMIZE WINDOWSILL CLUTTER - The reliable space saving Veg Ledge suction cup shelf gets your plants off your windowsill and onto your window. PLANTS THRIVE - The porous fiber of the Spongease soil supplies abundant oxygen to plant roots so they don't drown. The #1 reason for plant failure. IT DOESN'T GET ANY EASIER - No need for a green thumb, anyone can grow all kinds of plants with ease, give as a gift, sure to wow. It's proven that our mental and physical health can be dramatically improved by adding plants to our environment. But many people are apprehensive about growing plants either because they lack the knowledge, time or claim "brown thumb". You have no excuses now, its time to get growing with Window Garden! We've designed each Window Garden product with you in mind, all our products are complete and simple to use with detailed instructions, plus they look great in any décor. What are you waiting for? Start your decorative or edible indoor garden of flowers, herbs, veggies or microgreens today! WATER - The Aquaphoric planter is passive hydroponic, your plant roots absorb only the water it needs from a built in aquifer, so there's no guessing on when or how much water to give your plants. The handy gauge tells you when to add more, you can't miss! OXYGEN - The most common reason for plant failure is lack of root zone oxygen from overwatering and soil compaction. Not anymore. We've included an extremely porous growing medium for maximum air space, so roots can live, breath and thrive. Deck your home with lush beautiful windowscapes, no need for counter space, the Veg Ledge creates a whole new space saving way to garden vertically. Now you can give the gift of plants without worrying about plant failure.